This Deck Was Damaged In A Wind Storm. 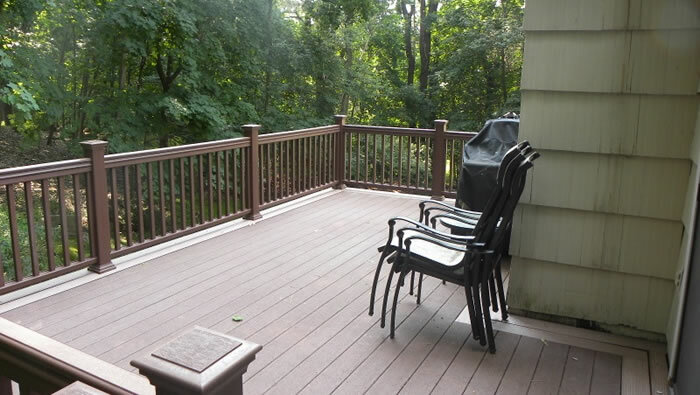 Craftsman Contracting Replaced The Railings – See More Below. 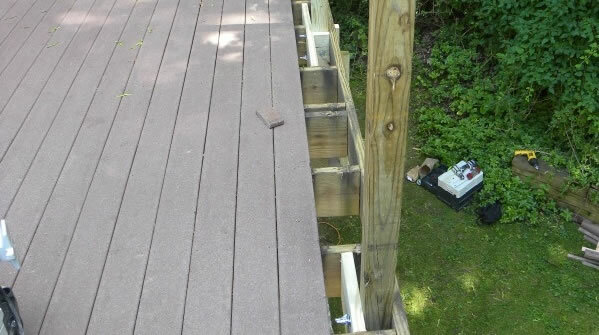 In the top picture you will see a completed repair to a deck which was damaged during a storm. This project posed some difficult challenges. A tree had struck the deck, damaging several sections of railing as well as a large portion of the border of the deck. 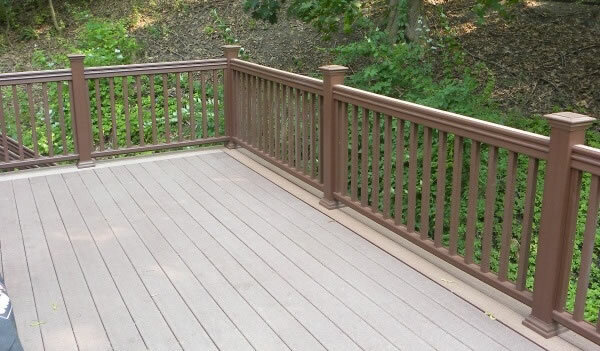 Unfortunately for the client, the original decking and railing was a first generation composite material, and is no longer available, so simply replacing the damaged pieces with the same material was impossible. 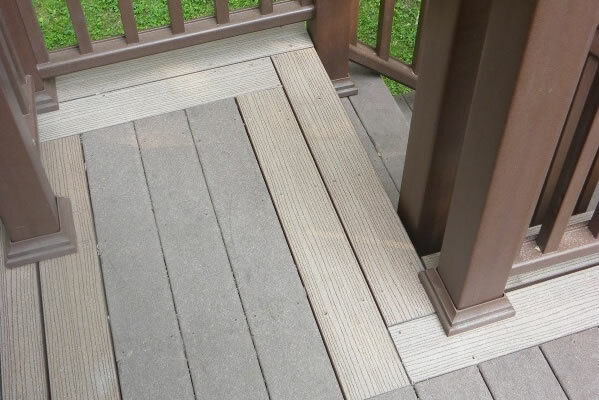 Financial constraints removed the option of removing all of the decking and providing a brand new deck. So Craftsman Contracting provided the owners with a cost-effective solution which would also provide a stylish look while blending in with the original decking. We Replaced The Railings With New, No-Maintenance TimberTech Railings. deck was constructed. While this job required some thoughtful planning, performing the work proved to be just as tricky in order to execute a seamless transition. Using a Rail Saw To Cut The Deck With Precision. 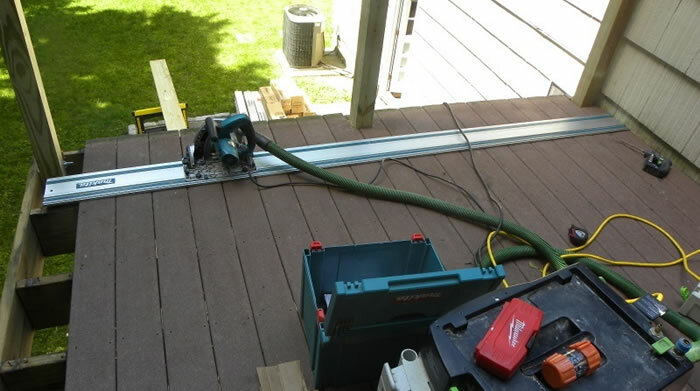 This equipment allows for a perfect cut across the decking, as well as providing nearly 100% dust collection through our dust collection system, making this job virtually dust-free. And in this final picture you will see the damaged decking removed, new posts installed, and the deck ready for finishes. Do You Have Some General Carpentry or Repair Projects You Need Completed? We’ll treat your project as if it were our very own, ensuring the highest level of quality in everything we do. Whether you’d like to repair some rotting deck boards, or the fascia boards on your home. We at Craftsman Contracting pride ourselves on the attention to detail and quality of our workmanship that we invest into each and every carpentry project we work on. A custom carpentry project relies on careful planning, excellent communication between client and contractor, precision & accuracy, and the contractors ability to understand and execute the plan without excuses. At Craftsman Contracting, we believe that is exactly what we have to offer. If you’d like to schedule a consultation to discuss your carpentry or repair project then give us a call (203) 642-3343 or fill out our contact form and we’ll get right back to you.